Every year during the holiday season one of the things I need to help organize at work is our holiday luncheon. The luncheon is always a good time because its our opportunity to get away from the office for a few hours, leave the stress of work behind us, and spend some time just enjoy each other’s company, some good food, and definitely a lot of laughs. Just a few years ago, our holiday lunch was just myself and 3 other co-workers for a small, intimate lunch. In just a couple of short years, we’ve gone from a table for 4 for lunch to being able to have our holiday lunch a small private room at a table for 8. This year’s restaurant selection was chosen by my boss, at a local restaurant in the neighborhood that most of us and had never been to before and organized with the help of one of my co-workers who put the whole thing together, including arranging our luncheon so that we could all order off of the regular menu and dine on what we chose rather than having a set menu put together in advance for us. It’s always nicer when you can order what you want to order. Palmeri Ristorante is a long time Brentwood neighborhood-favorite Italian restaurant. Chef and owner Ottavio Palmeri brings to life Sicilian-inspired dishes at this corner-location restaurant with a full bar and friendly staff that has quickly become one of my boss’ and his family’s favorite restaurants. 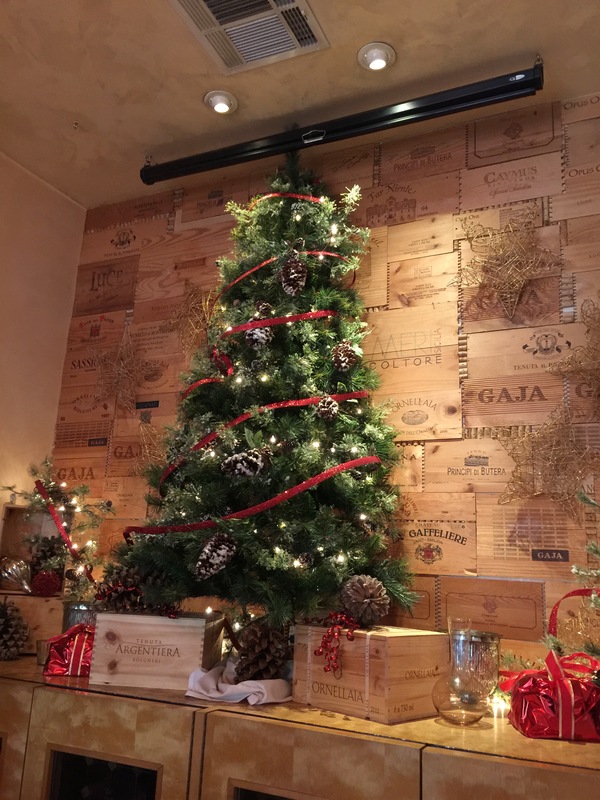 For our holiday luncheon, Palmeri generously offered to us the use of their beautiful private room, which also houses the restaurant’s extensive wine cellar, and was beautifully, but tastefully decorate with this Christmas tree to help bring in the holiday cheer. 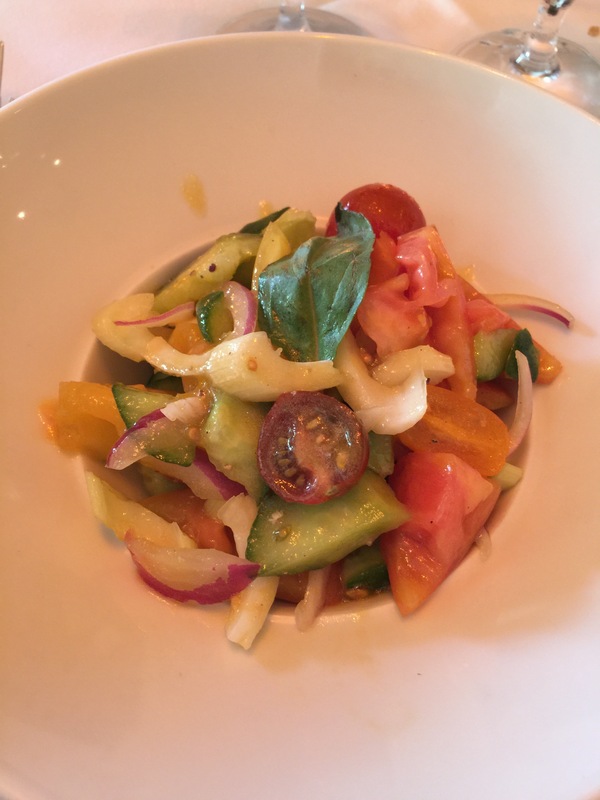 I started off my meal by ordering the heirloom tomato salad with celery, red onions and olive oil. Every time I have a salad like this, I’m blown away by how simple the ingredients are, and yet how delicious the dish is. If I were to throw these ingredients together at home to try to make my own salad, it would never turn out tasting half as good as this salad was. The heirloom tomatoes were full of flavor and texture and I loved the addition of the celery, which I don’t generally see in salads. The celery gave the salad terrific crunch and texture and helped to mellow the bite of the red onion. Over all, the salad was simple, yet refreshing and a great start to the meal. We decided to split a couple of appetizers for the table so that we could all take a little sample of the dishes Palmeri had to offer. We chose the burrata, heirloom tomatoes and basil dish, which was Palmeri’s take on a traditional Italian caprese salad. 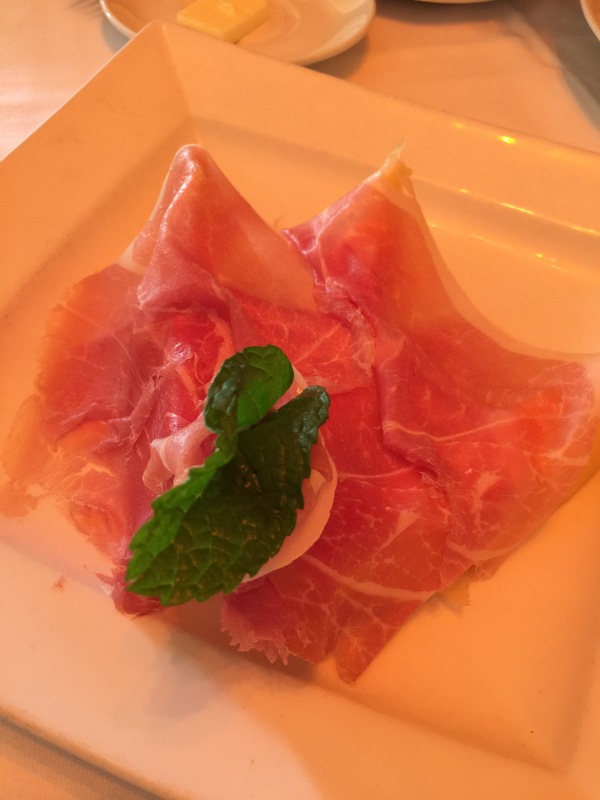 And our second appetizer was an Italia classic of prosciutto e melon, or “parma” prosciutto with melon. On the salad, I really liked the use of fresh burrata rather than buffalo mozzarella. 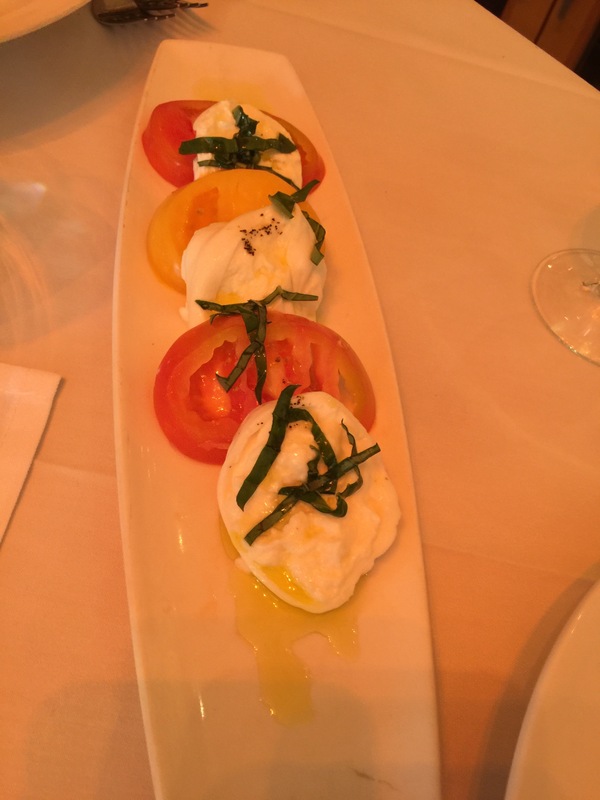 The burrata was creamy and rich and was a perfect compliment to the tanginess of the heirloom tomato. Again, this dish is all about the ability to coax a ton of flavor out of simple preparation of minimal ingredients. It was fantastic. And with the prosciutto and melon dish, it’s such a classic that you always know what you’re going to get. Wonderfully ripe and sweet cantaloupe wedges served with delicious prosciutto, you just can’t go wrong with that flavor combination of the salty and the sweet together to balance each other out. 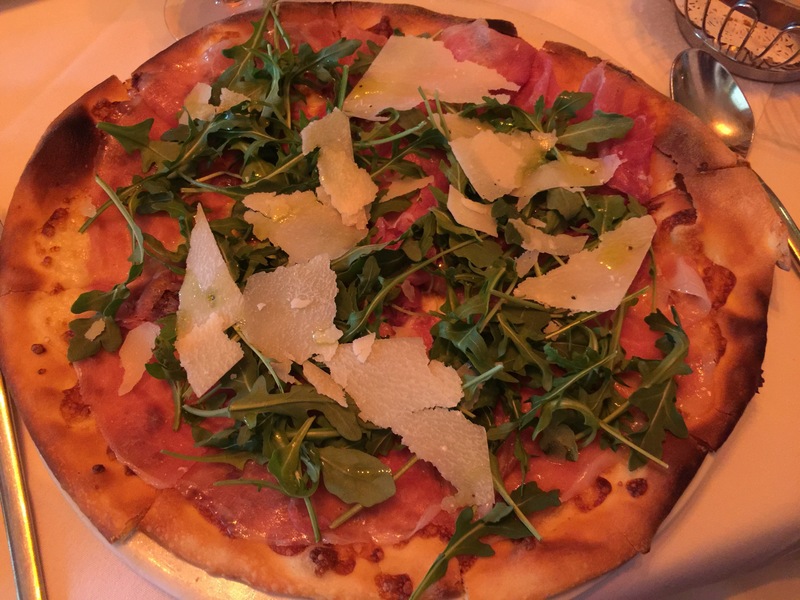 For my meal, I ordered the Fornarina pizza made with mozzarella, “parma” prosciutto, arugula, parmigiana reggiano and truffle oil. The pizza was perfectly cooked with a thin enough crust that it got nice and blistered and crispy on the bottom. The baby arugula had such a nice peppery bite to it that it paired well with the salty prosciutto and the salty parmigiana reggiano. And how could you not love the fact that they did not skimp on the shavings of parmgiano on the pizza, which gave the pizza that added flavor and oomph it needed. The light drizzle of truffle oil took the pizza over-the-top, and a little truffle oil goes a long way as it’s flavor and essence are infused into every bite. The pizza was large and filling, and frankly too much for me for lunch. Luckily, I was able to box up half the pizza to take home and have for dinner late that night. Since we were there to celebrate the holidays and celebrate the year we’ve had together at work, how could we resist ordering some dessert? Some of us aren’t dessert people (which is just ridiculous if you ask me! ), but after a little bit of peer pressure, everyone gave in and ordered a little something. 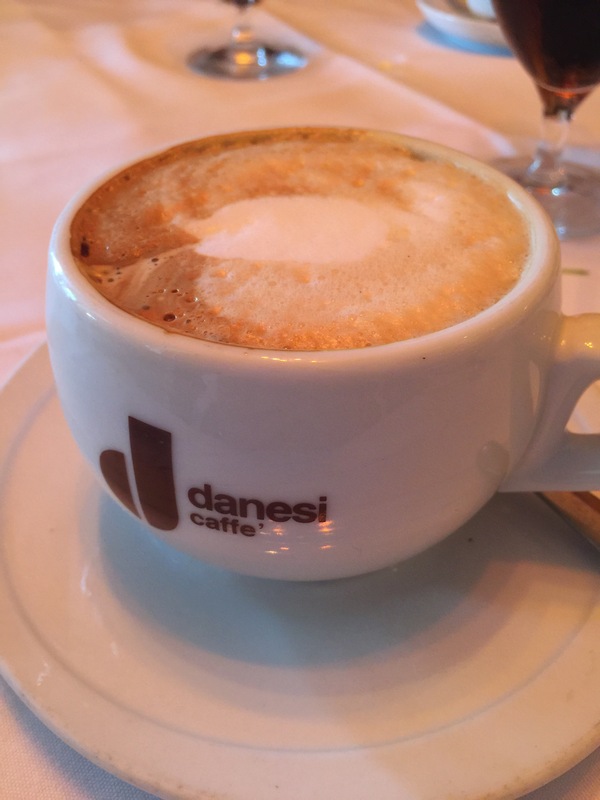 And like any true Italian meal, it’s not just dessert after dinner, it’s coffee too! You don’t have to ask me twice about an after dinner coffee, I took the opportunity to order myself a latte. This is an Italian restaurant after all, and they are going to do their coffee drinks the right away, hand crafted using rich, fresh and perfectly roasted coffee beans. Such a treat to savor a nice, well created deliciously strong latte after a rich, filling meal. 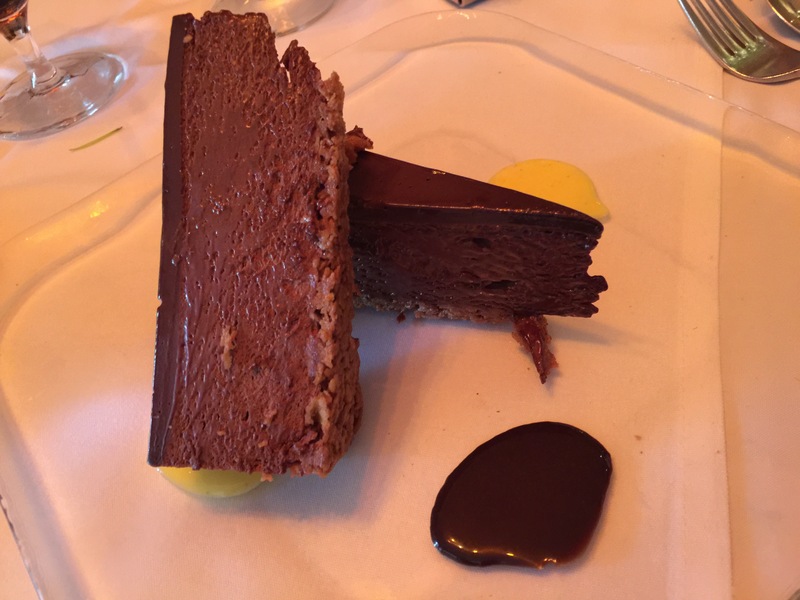 For dessert, I ordered the cioccolato, described as a Valrhona chocolate hazelnut crunch cake. Eek, first off, this dessert was much larger than I had anticipated it to be. After a filling meal, two slices of cake seemed like a lot for one person. However, being the trooper I am, and considering how good this cake was, I was able to finish both pieces on my own. I was stuffed, but it was good! The flavor of the Valrhona chocolate was smooth and creamy, and the hazelnut added the touch of sweetness needed. The crunchy “crust” of the cake was almost like a crispy rice texture which worked well in this dessert and gave it added crunch and contrast to the creamy mousse “filling” of the cake. The sweet layer of chocolate ganache that capped off the cake was the perfect sweet note to finish off this delicious cake. It’s always fun to get together and share a good meal with co-workers and colleagues at the end of the year. It’s a great time to just get away from the office and relax and share stories and have a good time. This year’s restaurant selection was a good one. Having a private room was nice and comfortable so we could just relax and be ourselves. The food was filling, delicious and quickly and efficiently served. The cioccolato dessert was my favorite dish of the day, and even though I was stuffed to the gills, the cake was so delicious that I found the room to put away the two pieces of cake. It’s easy to see why Palmeri Ristorante is a favorite of my boss and his family and why it’s been a family and neighborhood favorite for years.